Here is a selection of my paintings, if you want to see more please visit my blog which lists almost all pieces in quasi-chronological order. The majority of the pieces displayed here have been painted in 2009 and later. At the end is small selection of older pieces. Choose from the list after the photo. 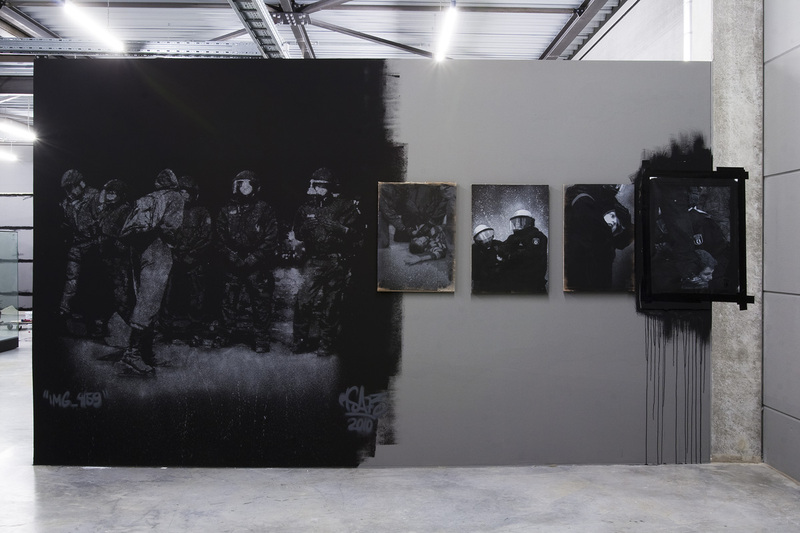 The photos above shows my space at Carhartt Gallery in Weil am Rhein, 2010. Four 70 x 50 cm pieces painted on cardboard. The pieces picture demonstrators being arrested by the police. “IMG_6687″, “IMG_5297″, “IMG_5309″ and “IMG_5287″. A series of four paintings based on photos taken during Walpurgis Night in Berlin, 2007. The paintings are very dark and very silent, only one color has been used. They are all named after the file name of the original photographs. A diptych showing a blonde woman in a vaguely riefenstahlesque fashion in one panel and with her face replaced by a cartoon character in the other. Three photos of my Primary Flight 2009 mural in Miami. A mural painted for the exhibition “Street/Studio” at Irvine Contemporary in Washington DC, 2009. I really need to break this list of older pieces down into something vaguely organized, like categories for instance. Yes, that’ll do. So here we go. In categories. The first one: car themed paintings. Here you have some paintings which prominently feature words of mock-encouragement or moral directives. Of all discarded materials I have used as canvas, cardboard is my favorite. It offers so many ways to be incorporated in the painting: for instance it can either be painted just like a regular canvas, or parts of what ever is printed on the cardboard can be made a part of the painting. Finally a random selection of pieces.